The American Bison population, being only 375,000, doesnt meet the supply and demand for meat sales and breeding stock. Bison products such as head mounts, skulls, hides and bones are marketable items. Bison meat is lower in calories, fat and cholesterol than beef, turkey or chicken. Bison market potential is high with little to no export compared to chicken or pork. Bison are self sufficient, not needing to be milked or grained, with little or no veterinarian care, handling or calving problems. Bison being raised on 1.5 acres per head are well fed, happy bison and therefore wont stress the fences like other bovine animals. Bison never overgraze, eating 1/3 less food compared to other bovine animals. Bison dont require high quality forage compared to other bovine animals. Bison can survive wind chills of minus 100 degrees Fahrenheit without shelter or near constant feeding that cattle require. Bison are majestic, intelligent, challenging and curious. 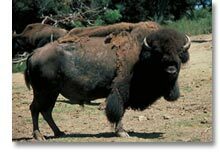 Bison are North Americas oldest and largest living land animal. This page is displayed with the permission of Rocky Ridge Bison Farm, Elroy, WI.